Back at the beginning of June (yesterday, right?) 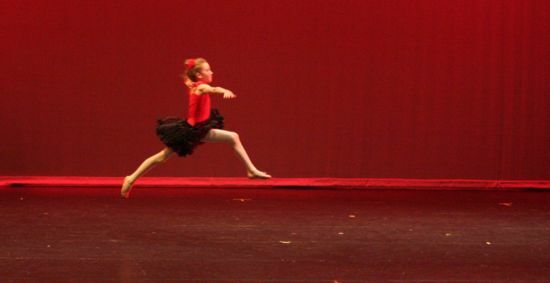 Caitlyn's participated in Spectrum's All-School Demonstration performance. Her Ballet 1 class danced to tango music. All the other pictures have other kids in them, so you'll have to enjoy just this one. Sadly you can't see the sequins all over the front of her leotard, the detail she loved best about the performance. After her class, in the weeks leading up to the performance, this was the detail she'd talk about the most: the sparkly red leotards, the shiny red satin shirt for the one boy in the class, the red flower in her hair, the black hat for the boy. Dance-shmance, bring on the costumes! This led to numerous discussions about whether she liked ballet class and what she liked about it. Eventually, Caitlyn decided that this would be her last ballet performance for the foreseeable future. Time to try something else... like theatre! I had very specific requirements in mind when I went searching for a theatre program for her. It needed to be inclusive (no auditions yet!) and culminate in a performance of some sort. Reasonably priced and reasonably close got bonus points. I'm so pleased with what I found, a "performance series" at Youth Theatre Northwest: Three weeks of full-day "camp" with a three-show performance run at the end. Caitlyn came home on Day One with a 48 page script and a role assignment. There were lines to learn, blocking to work out, costumes to design and sets to build. The kids did everything. 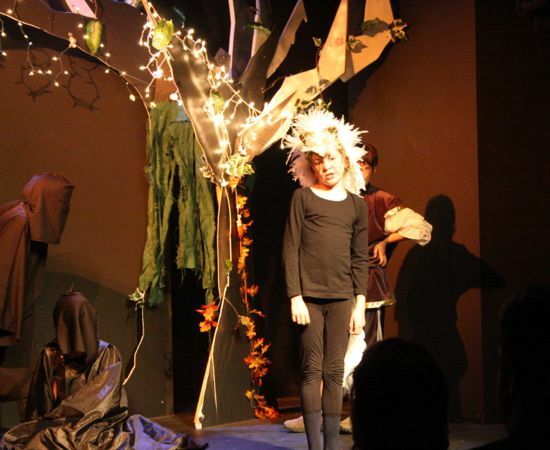 The play, Under the Hulder's Spell, was written specifically for YTN's performance series and tells of the rescue of a sister stolen by the fae ("the Hulder"). Caitlyn was the White Cat (Who Is Really An Enchanted Princess) and she loved her white headdress and long tail. My favorites of her lines: "And I'm totally not picturing you wrapped in a piece of liver right now," and "Remember, if you don't vote, you can't complain." 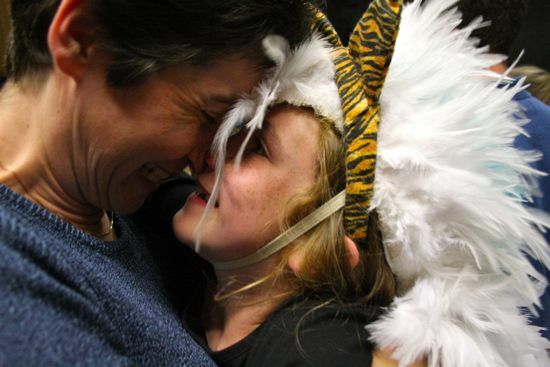 Caitlyn loved the whole experience (and especially her instructor, Amy), always eager to arrive and enthusiastic about the day when I came to pick her up.She nailed her lines each of the three performances, looking out into the audience and speaking up every time. Oh, wonderful days! I still remember the grass skirt and mama-made hula top with flowers sewn on to it and the flower anklet from my first ever dance recital. Happy memories. We had that grass skirt for the longest time!